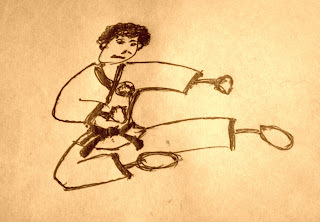 In a previous post under the Health, Fitness, and Recreation category I talked about a memorable and humiliating experience I had as a young martial arts practitioner and the subsequent payback that eventually occurred in my bout with Jeffrey Wong. In this post I would like to pay homage to the man who got me started in Karate. I do not know much about him. He was an east Indian cane-cutter who ran a small karate dojo in Providence,Guyana, a small village not too far from my village, Bagotstown. He was known simply as Sensei Henry. His right arm appeared to have been paralyzed, and his huge right arm reminded me of the arms of Popeye. He was a very kind man with a booming voice, and was noted for his rum-shop brawls in which he always came out the victor. Were it not for his kindness, I would not have become involved in Karate. I was twelve years old and a boy scout. One day, on my way to a Boy Scout's meeting I heard some strange sounds coming from a building on the side of the street. Curious, I took a peek through one of the open windows and saw a group of men dressed in white, going through motions of kicking and punching. I never got to the Boy Scout's meeting nor ever attended again since. Every Monday, Wednesday, and Friday I would stop at the dojo to watch the men practice. I wanted to learn to fight like those men so that I could defend myself against the bully who was always punching me in my village. I did that for several months and then started arriving before the dojo members and would sweep the hall before they got there. All the while my parents thought I was at Boy Scout's. Noticing my interest, Sensei Henry invited me to join the dojo. I told him that I could not pay the 50 cents per week membership fee, and he told me to join the group anyway. It was not until two years after that my parents found out that I was studying Shotokan karate and not attending Troop meetings. Thank you Sensei Henry (wherever you are) for the wonderful gift you gave me as a youngster through the discipline and skills I developed from studying with you.